Conquering supply chain transformation is ‘a must’ for the future survival of retailers, as they move from self-sufficiency to collaborative networks. Consumers are becoming exponentially more demanding, and expect retailers to deliver new services to meet their evolving needs. The retail world continues to change and evolve as retailers battle for customers across channels and even across the supply chain. The latest challenge for brick-and-mortar retailers is fierce competition from online retail giants who are attempting to disintermediate retailers right out of the supply chain in other segments, just as they have done with books, software, and games. To compete, retailers need to leverage their stores as “theater” and transform their supply chain to meet customer expectations. As investments in systems are made across the supply chain to address consumer demand, it is critical that key components are included in any technology decision. Each organization must define its individual vision within three areas: the ability to seamlessly allow ordering, delivery, and returns across channels; the capability for real-time visibility across channels; and the need for tighter collaboration with strategic vendor partners to reduce costs and the time-to-market for products. These three areas are catalysts for the necessary supply chain transformation and should be assessed carefully. Boston Retail Partners’ recent premiere of the 2013 Supply Chain Benchmark Survey delves into some of the ways retailers are managing this supply chain transformation and details the supply chain trends and initiatives around these three key areas in the industry: Integrated Omni-Channel Capabilities, Supply Chain Visibility, and Collaborative Vendor Management. 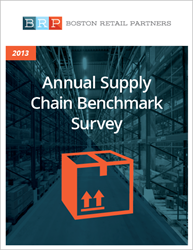 Read more about supply chain transformation in the 2013 Supply Chain Benchmark Survey available at http://www.bostonretailpartners.com. Boston Retail Partners is an independent management consulting firm dedicated to the retail industry. We specialize in strategy, selection, and implementation of Point of Sale, Omni-Channel, CRM/Loyalty, Merchandising, Supply Chain and IT solutions. Our clients choose us because of our unique combination of industry focus, knowledge-based approach, and rapid, end-to-end solution deployment that helps them achieve their business potential.